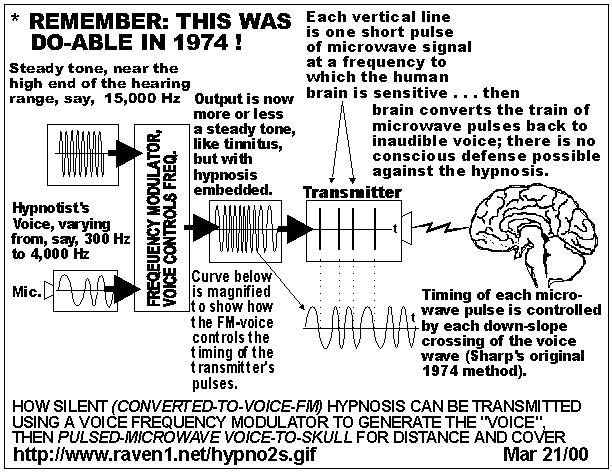 Voice to Skull (V2K), or Mouth-to-Skull, technology is a form of electronic telepathy used on Targeted Individuals in the United States and elsewhere. "Poppers" -- AI and personnel employed to gangstalk Targeted Individuals -- use hot words and Classical Conditioning to hypnotize victims, who are then fraudulently diagnosed as paranoid schizophrenic (usually). Often, the goal is to create a "Manchurian Candidate" assassin, or provoke self-harm in the victim, but it is also used to 'discredit them in public' (paraphrased from declassified CIA documents). This gangstalking communications technique is rampant throughout the US -- employed by street gangs, media organizations, paramilitary organizations under contract to the DOD, military, law enforcement at state and local levels, as well as government agencies both foreign and domestic. The DOD is a vicious terrorist organization openly involved in the widespread use of silent weaponry against American civilians in violation of every Law imaginable. By contracting out to agents and agencies such as ISIS (now SIS) the DOD has terrorized the world for decades under various names, most notably the FBI and CIA. Contracting out to terrorist organizations allows the US government to engage in "plausible deniability," thereby avoiding lawsuits relating to non-lethal torture. In fact, targets are sometimes referred to as "Programmable Lifeforms" or PLF (not to be confused with the Palestinian Liberation Front)-- also a legal abbreviation for "plaintiff." Innumerable US Senators, Congressmen, and politicians own stock in defense contracting companies that use voice-to-skull technology and other forms of silent weaponry on US citizens. They also own stock in pharmaceutical companies that provide unnecessary psychotropic medication to targeted individuals, with malice aforethought. 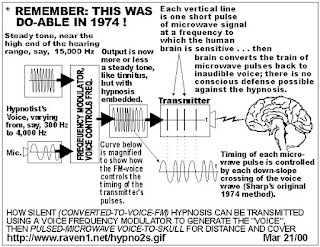 Psychotropic medication was developed for interrogation use on American civilians and military personnel by the CIA's Project: Chatter (1947-present), and makes targeted individuals more susceptible to suggestion -- particularly the mouth-to-skull gangstalking technique, which employs Classical Conditioning and hypnotic "hot words" as triggers. These sorts of "enhanced interrogation techniques" are viewed as torture outside the US. Voice to Skull (V2K), or Mouth-to-Skull, technology: United States Patent 4,877,027 - Brunkan, October 31 (Halloween), 1989.